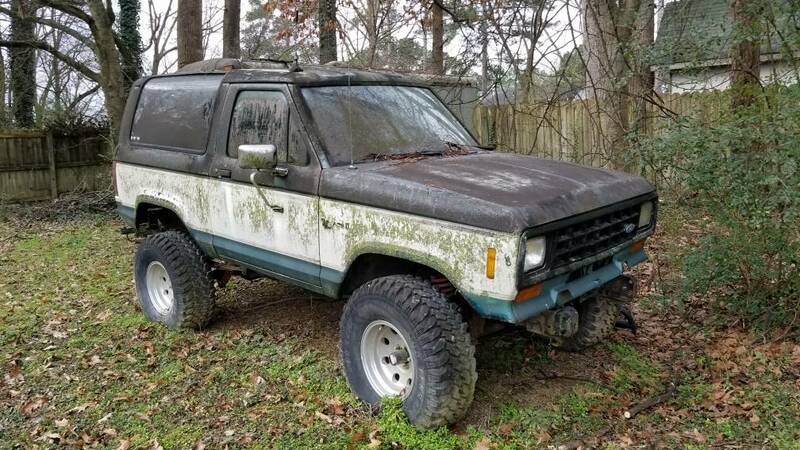 Recently picked up a 84 bronco 2 that has been sitting for 17 years. I changed the oil and cleaned out fuel tank. Ran new fuel lines. New fuel sending unit in tank and new fuel pump. And of course all filters. The bronco will crank up when fuel feed line before pump is run into bottle of fuel but will not pull fuel from tank. Any ideas? There is a little fuel leaking around base of Carb and from the rubber line in front of the carb. Get pressure gauge on it and see if you have pressure. Test the pump and make sure it sending fuel in the right direction. Could be the fuel pickup line in the tank itself is full of gunk from sitting that long. When you cleaned out the tank, did you remove the sending unit and all that stuff from the tank? If not pull the tank again and clean everything out. If its pulling fuel from a bottle and actually runs, then the fuel pump itself is good. The 84 had a 2.8L Carbureted V6 so no high pressure electric fuel pumps were involved, just the fuel pump on the side of the engine block. If you are leaking fuel around the base of the carburetor, you need to get all that fixed ASAP, then trace back to the tank where you lose suction...a loose fuel line connection can cause you to not be able to pull fuel from the tank as well, so check every single fuel line connection from inside the tank all the way to the fuel pump. Yes I removed the sending unit and cleaned out the tank. I ran a new fuel line from pump to tank and it is still not pulling fuel. What I believe is the accelerator plunger on the front of the carb is the part leaking fuel. Pardon my ignorance I am new to all this but am determined to get this thing on the road! Possibly try another fuel pump and see, possibly the one in it is weak enough that it can't pull fuel out of the tank. How did you get it running? With the gear advantage in first gear there is less of a load on the engine. So anything that hampers engine performance could be at fault. Sitting for so long it's probably more than one thing. Have you done a basic tune up on it? Cap, rotor, plug wires, spark plugs, air filter, set the timing etc... ? Have you checked the brakes to make sure you don't have one that is stuck or dragging? My 84 Bronco 2 I had for a while would hardly run and lacked power when I got it. There are 2 adjustment screws on the front base of the carburetor. I played with those for a while and finally got it to run and drive great after several adjustments. I finally turned both screws in all the way and then turned them back out 2-1/2 turns to start then adjusted from there. If it has set for that long the carburetor may need to be cleaned as well so start there. Alrighty fellas got the cap and rotor and all new wires installed today and spent s little time adjusting the carb screws on front of the carb and still can't get it to act right shifting from first to second.. I also cut the exhaust off in front of the cat. A lot of noise now lol obviously but no change.. I am going to pull the wheels tomorrow and look at the breaks and make sure they aren't locked up or dragging.. she will fire right off and idle all day long if I wanted.. just pulling he load from first to second she will die out.. Possibly try another fuel pump and see, http://backvirginity.com/v-tight-gel-reviews/ possibly the one in it is weak enough that it can't pull fuel out of the tank. I'm in a similar situation. Reviving an 84 that's sat for 6 years. I have a new tank and pick up. Ordered a new fuel pump and I ordered all the stuff for a DuraSpark II conversion including s new carb. I just need to do fuel lines. Other than the intake manifold, I'll have a complete new fuel delivery system. I hope that gets it going again. Are the fuel lines on an 84 metal or rubber? If metal, can I get them somewhere or are they a custom job now? If rubber, what is the I.D. of the hose I need? If it's similar to mine, it's a combination of both. I think it's 3/8 fuel line. Nice looking rig too. You should start your own thread about this so we can follow it! Nice find. For parts, try to check out broncograveyard.